The Orange Clockwork has grown into more of a family than a solitary model. A family of bikes where capability is key. These siblings bring different rolls to their functional heritage. Let's start with the new Orange Clockwork 109, a versatile 100 mm travel, 29 inch wheeled, do it all aluminium hardtail. The frame's confident performance geometry with solid features like the bolt through 148 boost rear and internal routing show this bike means business. Specced with the new RockShox Judy fork with lockout and adjustable rebound, with a SRAM NX drivetrain that brings fuss-free shifting with a wide gear range on a clean and tidy 1x11 set-up. Ready for anything, be that bikepacking or ripping round the local trails, this Clockwork will inspire you to just get out and ride. Sunset Cycles offers the 2018 Orange Clockwork 109 29er hardtail mountain bike with up to 24 months 0% finance and free delivery. Rider Height Guidance* 5'6" to 5'10" 5'9" to 6'1" 6'0" to 6'5"
Seat Tube Length 17" 18" 20"
Unless otherwise indicated all measurements are in mm. 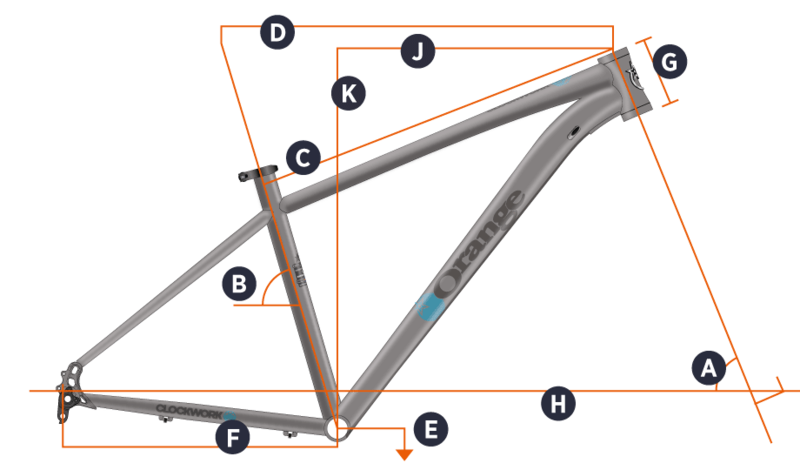 Frame angles are measured static, without rider sag. Bottom bracket height measured from axle.